The weather and general climate in Wellington, on the North Island of New Zealand, is quite mild and fairly temperate, with the best weather and most tropical climate during October to April, when temperatures in Wellington and throughout New Zealand are at their highest. Wellington's weather is noticeably cooler during the winter months of June, July and August, although winters in Wellington are quite short and never extreme, with only occasional frosts. Wellington's climate, on the south-western corner of the North Island, is often quite different to the weather experienced on New Zealand's nearby South Island. Weather in Wellington and New Zealand can change quickly, with sub-tropical cyclones and cold fronts affecting the climate at times. New Zealand's two islands also feature very distinct rainfall patterns, with the weather and climate in Wellington being affected by the winds that travel across from the western Tasman Sea. Wellington and New Zealand have a moderately high rainfall and rainy weather is far more likely during the winter. Windy weather in the Wellington area is not uncommon, particularly around the southern Wairarapa coastal regions. 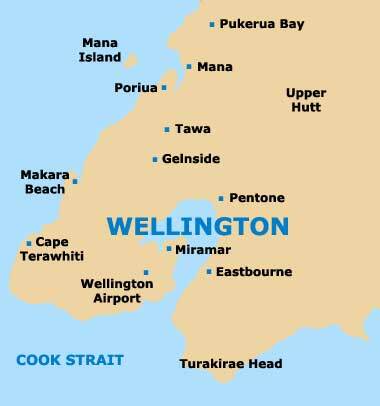 The climate on the North Island of New Zealand is generally warmer than the South Island of New Zealand and the hottest weather in the capital city of Wellington arrives in the summer, during December, January and February, when temperatures can exceed 27°C (80°F). Wellington Weather Charts - further Wellington climate statistics and charts.